Amid reports of escalating tensions in Iraq, investors have increasingly turned towards safe-haven assets, such as the Japanese yen. Because the country does not rely on foreign capital to fund its deficits, its currency is traditionally seen as a solid store of value during periods of economic uncertainty or geopolitical tension. 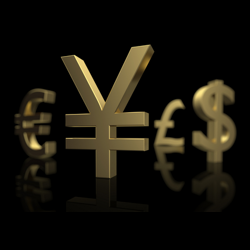 As a result, the yen advanced in today's forex trading and reached a four-month high against the euro. This comes amid fears that global oil supplies will be disrupted by the conflict in Iraq, where military spokesman Qassim Ata said the country's army killed more than 279 'terrorists' just north of the capital Baghdad over the weekend. Oil prices also rose sharply on the commodity markets as 50 vehicles belonging to Sunni insurgents were destroyed in a 24-hour period of sustained violence. The shared currency came under renewed pressure after an official report confirmed that inflation across the Eurozone had slowed to 0.5 % in May. This represents a drop from 0.7% in the previous month and is the eighth consecutive month in which prices have risen by less than half the European Central Bank's (ECB's) target of just under 2%. Earlier this month, the ECB introduced several radical stimulus measures in an effort to prevent the region sliding into deflation, including reducing its benchmark interest rate below zero. Elsewhere, the pound has strengthened to a five-year high versus the dollar on the back of comments from Bank of England Deputy Governor Charlie Bean. Building on remarks from Governor Mark Carney at the Mansion House event last week, Mr Bean told the Sunday Times newspaper that the first UK interest rate hike 'will be a symbolic step because it will be an indication we are on the road back to normality'. Mr Carney suggested that borrowing costs may be lifted before the end of the year, far earlier than initial projections. Markets had previously priced in a move for the second quarter of 2015, but the bank's original forward guidance policy suggested that such action would not be forthcoming until 2016.